I quite like this. Haven't heard anything from Jon before, but I think this is a good effort. 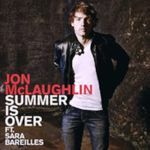 The vocals of Jon and Sara work quite well together. It certainly sounds different now that summer is over. I can't help but feel that it's a little too long, and I'd prefer it a little more otherwise. Rather average, guess i just can't get into Bareilles since 'Love Song'. Leuk klinkende plaat, zou prima staan in een ultratop.